The 1950 Buick frame has high carbon pressed steel members riveted and welded together to form a rigid assembly. The outer and inner side rails, center diagonal cross members and rear cross members are of channel section. The front cross member is box type to form a strong support for the front suspension members. The chassis rear spring seats are formed in the cross member at top of rear kick-up. Upright brackets are bolted to the inner side rails to support the engine. See figure 9-1. All series frames are very similar in design, relative parts being merely made longer or of thicker gauge, as the need requires, to take care of longer wheelbase. The 1950 Buick frame for convertible coupes and estate wagons isidentical in general design, number of cross members, and arrangement of parts with closed body frames, but additional reinforcement is added to compensate for loss of the inherent rigidity of closed bodies which does not exist in convertible coupe and estate wagon bodies. The front inner side rails, rear kick-up reinforcements, diagonal cross members and gusset plates are of heavier stock than in closed body frames. When a 1950 Buick frame has been damaged by accident the following procedure may be used to check alignment of the 1950 Buick frame, and the alignment of the chassis suspension members with the frame. This procedure should be used to check alignment after repairs to 1950 Buick frame have been completed. Checks are to be made with 1950 Buick frame assembled with power plant, body, etc. and car resting on wheels. The car should be placed on a clean floor that is reasonably level. Both sides of the front ends of the 1950 Buick frame must be the same distance from the floor; the same condition must exist at rear end of 1950 Buick frame. Where points are to be extended to floor by use of a plumb bob, it is desirable to attach clean pieces of paper to floor with tacks or tape so that the points can be clearly marked. Apply brakes or block wheels so that car cannot move. Using a plumb bob, extend the following points to the floor and mark where point of plumb bob touches floor, as shown in figure 9-2. C and C1 at 5/8″ jigging holes in side rails about 7″ to rear of bumper frame stops, holding plumb line flat against side rails. Divide the distance between C and C1 and mark the center point X on line C-C1. Divide the distance between F and P and mark the center point Y on line F-F1. Draw frame centerline through points X and Y. Measure diagonal distances A to E 1. If these diagonals are not equal within 3/16″ the frame is bent. Measure the distances J and J1. If these are not equal within 1/8″a lower control arm is bent. Measure the distances K and K1, which will be equal within 3/16″ if rear axle is properly aligned with frame. Points G and G1 should be equally distant from vehicle centerline X-Y. If distances K and K1 are not equal within 3/16″ and points G and G1 are equally distant from centerline, a bent rear axle housing or torque tube is indicated. If points G and G 1 are not equally distant from centerline, look for misalignment of engine in the 1950 Buick frame. 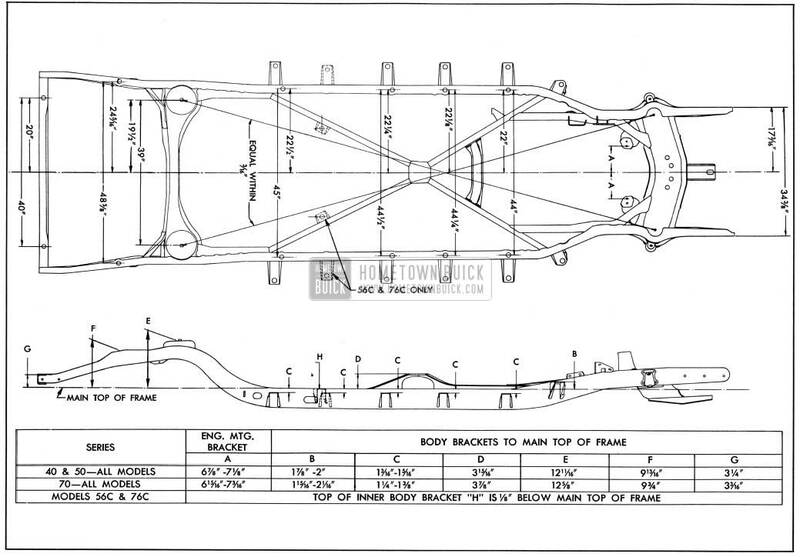 When a 1950 Buick frame has been damaged by accident and the power plant, body, etc., are removed, the measurements shown in figure 9-3 may be used to check for alignment of frame members. The procedure should also be used to check alignment after repairs to frame have been completed. The 1950 Buick frame must be solidly supported on suitable stands so that the top of side rails are level. Use a steel tape or adjustable trammel and a steel straight edge to obtain the measurements indicated in figure 9-3. In case of 1950 Buick frame distortion resulting from an accident it is permissible to straighten or weld the frame if the distortion is not excessive. Heat can be applied without materially weakening the steel, provided this is kept below 1200°F. This is a deep cherry red when viewed in subdued daylight, as in an average shop. Heat in excess of 1200°F. will weaken the metal structure and lead to eventual failure in service. If a 1950 Buick frame front cross member is very badly distorted as a result of a front end collision, replacement is advisable because its rigid box construction makes proper straightening very difficult. 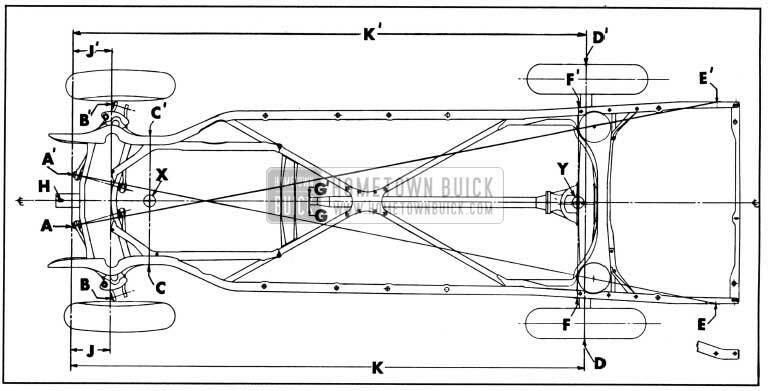 Since the front suspension members are mounted on the 1950 Buick frame front cross member, front end alignment will be affected if the cross member is not in perfect alignment. The front end and rear cross members, rear spring support cross member, and a number of braces and brackets are available for service replacement. The old members may be removed from the frame by cutting the attaching rivets and welds, after removing other parts or assemblies to allow working space. When installing new frame members use hot rivets since they can be properly driven with hand tools. Cold driven rivets are not recommended because they cannot be securely driven with hand riveting tools. In places where hot rivets cannot be installed it is permissible to use finished bolts snugly fitted in reamed holes. Use lockwasher with bolts and draw nuts up tight. Weld a new member to adjacent members in the same manner that the replaced member was welded. 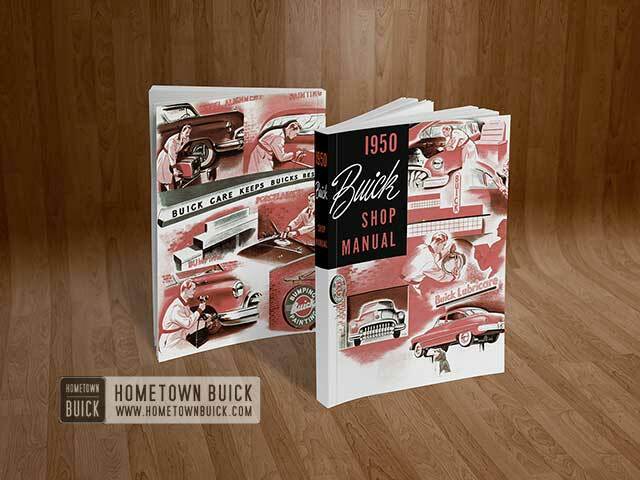 After installation of any new frame member check the 1950 Buick frame for proper alignment as described in paragraph 9-2. After any repairs or replacements in front end of frame be sure to check front wheel alignment (par. 6-30). Front and rear bumpers have one-piece face plates attached to car frame by short bumper bars which are sufficiently rigid to permit the use of a bumper jack for changing tires. The front bumper guards have cylindrical sections which house the parking and direction signal lamps. The rear bumper guards house the backup lamps when these are included in car equipment. A rail connecting the rear bumper guards supports the rear license plate bracket and the license plate lamp. The front license plate bracket is mounted on the left end of bumper. Nine vertical bars mounted on the front bumper face plate between the bumper guards serve both as bumper guards and the radiator grille. These grille bars are separately bolted to the face plate and may be replaced individually.